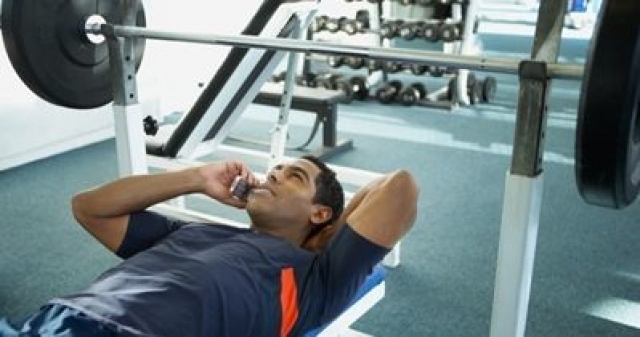 Today at the gym – On my personal blog today one of the subjects I ranted about was the insidious infestation of smart phone usage into modern society. People can’t seem to resist making visual love with their always connected electronic portals to the world for more than a few moments at a time. To me one of the most egregious examples of this sickness are people that insist on bringing their phones with them to the gym. Today we had one fine example. The guy was as white bread looking as you can imagine. A very manicured, parted to the side hair style, gray shorts that matched a lighter gray sleeveless name brand shirt and just enough extra weight that it erased any possible lines of definition in his physique. The guy was doing incredibly low energy exercises, if you could even call them exercises at all. It was more like some mild stretching. He used the infamous inflatable ball to do some of the least effective ab exercises possible, the big dowel rod to do very short radius trunk rotations and a couple other energy neutral movements. His phone use to exercise time ratio had to be at least 7 or 8 -1. I just don’t get it. Today was the first time I have done a 5 set untimed Ray’s Way since before my mystery ab strain and GI disaster, meaning at least 4-5 weeks have passed. Getting the five sets of 15 dips, 10 pull ups and 20 push ups down the pipe was a struggle as expected. However it felt good to endure the pain and not feel any weird twinges around my belly button during the workout. My hope is to make Tuesday’s my mini-brick day where I will run and bike, move DL/Squat to Wednesday and then squish shoulders, bi’s and tri’s into Thursdays. I think incorporating some intense cardio into the week will be an overall boost to my fitness routine.